Basis for the development of WQ based pollution control programs, including discharge permits, which dictate specific treatment levels required of municipal and industrial wastewater dischargers. 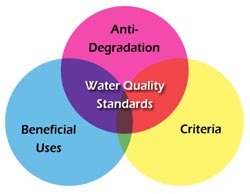 The WQS consist of three main components: (1) designation of beneficial uses, (2) water quality criteria to protect the designated uses, and (3) antidegradation policies. “Use Attainability Analyses” (UAA) that study individual sites or waters to determine its appropriate present and future Beneficial Uses, and set standards to protect them. Through assignment of as many Beneficial Uses as are attainable, Oklahoma’s WQS ensure that existing water quality is not unduly impacted. Science-based narrative and numerical criteria imposed in the WQS ensure attainment of Beneficial Uses while limiting waste and pollution of state waters. For water bodies that have quality greater than that required to protect Beneficial Uses, such as Scenic Rivers, some municipal water supply lakes, and water possessing critical habitat for endangered species, the WQS include an anti-degradation policy statement that provides more stringent protection and is designed to keep stream water quality from declining in these areas. Although all Oklahoma surface water receives broad protection through the WQS, explicit protection is afforded to approximately 27,000 stream and river miles and 650,000 lake surface acres. Beneficial uses have also been assigned to all groundwaters of the state that have a mean concentration of Total Dissolved Solids of 10,000 milligrams per liter or less. The Board also promulgates WQS Implementation Rules. Implementation Rules provide a bridge between WQS and water quality management by providing consistent application of numeric and narrative criteria. As in development of the WQS themselves, an extensive public participation process is utilized to ensure that the state’s water quality management process strikes an appropriate balance between environmental protection and sound public policy. WQS Implementation Rules contain Use Support Assessment Protocols (USAP) for Oklahoma waterbodies. Developed in coordination with all Oklahoma environmental agencies, the USAP establish a consistent and scientific decision methodology for determining whether a waterbody’s beneficial uses are being supported, outlining minimum data requirements for that decision methodology.